Scott Pruitt has been promoting a public climate science debate for most of his tenure atop U.S. EPA. But that effort appears stalled — at least for now. Despite reports that President Trump supports such an effort, there has been administration infighting about how it should occur, if the debate takes place at all. And some conservatives who are pushing the administration to challenge the prevailing climate science don't think Pruitt should lead the charge. They question whether wading into the politically charged issue could backfire for the administration if the outcome isn't what some Trump supporters are hoping for. Meanwhile, the clock is ticking, and observers acknowledge that any sweeping assessment of established climate science would take a while. "My impression is that the reason this has been slowed down is because there are questions to be resolved about how the thing is launched, where it's administered and how it proceeds," said Myron Ebell, director of the Center for Energy and Environment at the Competitive Enterprise Institute. "My impression is that the White House is receptive to doing it but is not receptive to starting it next week." Pruitt has been touting the idea of a climate science "red team" since at least July. He told Reuters last summer that "the American people deserve an honest, open, transparent discussion" about climate science. "What do we know? What don't we know? Does it pose an existential threat, what can be done about it?" Who better to do that, Pruitt said, than "red-team scientists and blue-team scientists getting together and having a robust discussion about that for all the world to see." He suggested then that the debate should be televised. Flash forward several months, and Pruitt is still talking about the red team, although his language has changed. The EPA boss told House lawmakers in December that the red-team idea was part of "an ongoing review internally, and it's something we hope to do." He said then, "We may be able to get there as early as January next year." 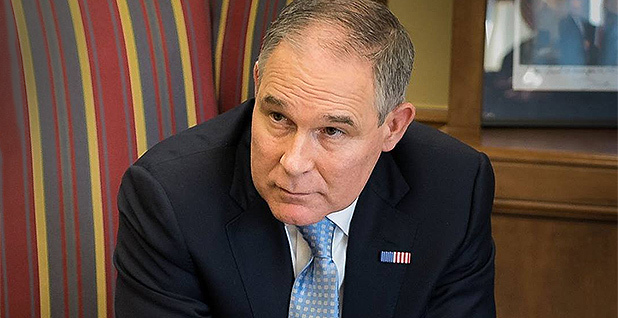 Shortly after Pruitt's testimony, EPA air chief Bill Wehrum attended a White House meeting with Trump energy aide Mike Catanzaro, Deputy Chief of Staff Rick Dearborn and others to discuss the future of the debate, an administration official told E&E News. After the talk, the red team was "put on hold," according to someone familiar with the meeting (Climatewire, Dec. 15, 2017). Late last month, Pruitt told a Senate panel that the exercise was still "under consideration." The EPA boss disputed reports that the White House had asked EPA not to go forward with the red-team debate, but he didn't offer any updates on timing or how the effort might unfold. EPA's press office did not respond to a request for comment about the status of the red team. Sources outside the administration point to a host of reasons the effort has languished. First, there's the internal debate. Trump has privately said he supports a public debate to challenge mainstream climate science, according to administration officials. But Trump's team hasn't been unified behind the idea, and an administration official told E&E News in December that "there are still many issues to be ironed out." One of those issues, according to observers, is who ought to take the lead. Among Trump officials, Pruitt has been the most vocal proponent of the exercise. Wehrum told E&E News last month that he thinks his agency is the appropriate venue, given that many of those pushing for the red-team debate are hoping to unravel the scientific endangerment finding that underpins EPA's climate regulations. "The endangerment finding is an EPA action, so to the degree we were to convene a process to take a look at the underpinnings for that EPA finding, I think almost necessarily it would be an EPA activity," Wehrum said (Climatewire, Jan. 4). But some conservatives have questioned Pruitt's long-term commitment to the cause, and some think others are better suited to lead the charge. "EPA Administrator Scott Pruitt's proposal for a Red Team-Blue Team exercise is vague, probably would not be effective, and is unlikely to come about," Heartland Institute CEO Joseph Bast wrote in an October email that summarized a meeting his group held about the climate debate. "More likely to occur," Bast wrote, "is a similar exercise directed by the head of another department" — like NASA, NOAA or the White House science office — "with more interest than Pruitt has shown in the scientific debate and more likely to stick around to see the results" (Climatewire, Oct. 16, 2017). Ebell said in an interview, "I don't think that EPA would be a credible place to lead the effort." He said there's a political danger that if the debate is housed in the wrong place, "it will not have sufficient credibility with the public." Proponents of the debate note vacancies in top offices that might play a role. Trump still hasn't picked a White House science adviser. His nominee for the White House Council on Environmental Quality recently withdrew herself from consideration amid criticisms of her climate science views. And the president's nominees to lead NOAA and NASA still haven't been confirmed. The issue of climate change is "just not on the front burner right now, so there's really no reason that the Trump administration should really be pushing on this," said Judith Curry, a former professor at the School of Earth and Atmospheric Sciences at Georgia Institute of Technology whose name has been circulated as a possible red team member. Curry said there are various groups advancing the red team: those that want "to see the integrity of science upheld" and others that "start from the point of 'Protect my short-term profits from fossil fuels, and anything that threatens that, I'm going after it.'" Some groups pushing for the debate appear to be in waiting mode. "I'm not aware that there's been any movement on the red team," said H. Sterling Burnett, a research fellow on environmental policy for the Heartland Institute. The conservative group held several workshops last year focused on how to convene a climate red team. "I'm not overly concerned. I think that [Pruitt] has got a lot on his plate," Burnett said in an interview. "The red team would be one small thing in his large portfolio." But if it doesn't happen eventually, he added, "I think it will be very disappointing." There are also questions about political risks the administration would take by kicking off such a debate. What happens if the red team is unable to unravel mainstream climate science? "I like to think that even Scott Pruitt recognizes what a loser this is for them," said Michael Mann, a climatologist at Pennsylvania State University. "The impacts of climate change are now obvious to anyone with an even half-open mind, and I suspect that their own focus groups and polling tell them that their anti-science tropes no longer are playing well with the public." It's also unclear whether those who support mainstream climate science would participate in the endeavor. "I would not legitimatize such a transparently political ploy by participating in it, and I would hope that other self-respecting climate scientists wouldn't, either," Mann said. David Doniger, senior director of the Natural Resources Defense Council's Climate and Clean Air Program, called the exercise "phony." All the administration can do "is appeal to the base; it'll never get anywhere in terms of bending the scientific consensus," he said. The military relies on red teams, Doniger said, for situations like trying to figure out whether a building in the desert in Syria is a nuclear reactor. A red team is brought in to try to critically challenge the thinking of a blue team. "The science on climate change is conducted in a totally different way," he said. "It's one giant peer-review exercise; it's one giant debate." Burnett of Heartland said there's no way the red team could lose if the debate takes place. "Right now, one side is not getting heard, and that's the whole point of it, to show that there's another side out there," he said. "The debate wouldn't be to settle the science for all time; you can't settle the science for all time. It would be to give one side a hearing that currently it's not getting." Ebell said his priority is credibility, rather than speed. "We're not as concerned about getting it launched this week or next month," he said. "Once you've started it, it's going to be very difficult to correct things that have been done in the wrong way." Of course, if the red team leads to an attempt to unravel the endangerment finding, it could take years. That would include lengthy court battles that could stretch well beyond the 2020 presidential election. "Sure, but it would probably be concluded in the second Trump term," Ebell said. "Everything takes time."